When you’ve got one of Google’s most helpful and empathetic voices willing to answer your most pressing SEO questions, what do you ask? Will Critchlow recently had the honor of interviewing Google’s John Mueller at SearchLove London, and in this week’s edition of Whiteboard Friday he shares his best lessons from that session, covering the concept of Domain Authority, the great subdomain versus subfolder debate, and a view into the technical workings of noindex/nofollow. Hi, Whiteboard Friday fans. 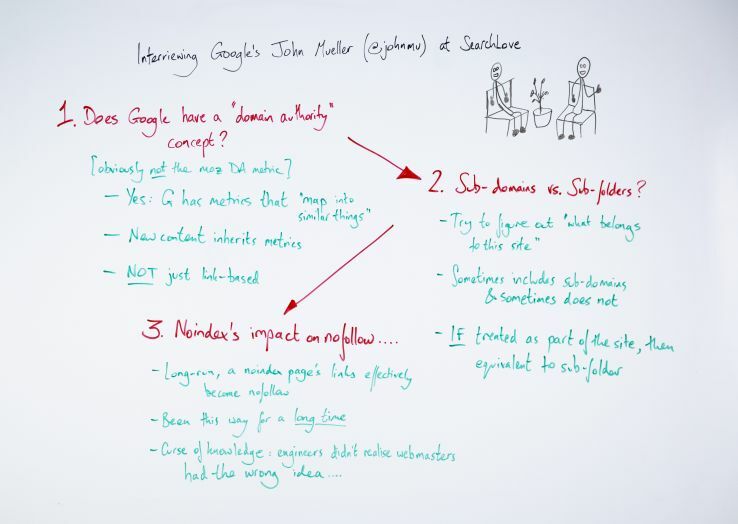 I’m Will Critchlow from Distilled, and I found myself in Seattle, wanted to record another Whiteboard Friday video and talk through some things that I learned recently when I got to sit down with John Mueller from Google at our SearchLove London conference recently. So I got to interview John on stage, and, as many of you may know, John is a webmaster relations guy at Google and really a point of contact for many of us in the industry when there are technical questions or questions about how Google is treating different things. If you followed some of the stuff that I’ve written and talked about in the past, you’ll know that I’ve always been a little bit suspicious of some of the official lines that come out of Google and felt like either we don’t get the full story or we haven’t been able to drill in deep enough and really figure out what’s going on. I was under no illusions that I might be able to completely fix this this in one go, but I did want to grill John on a couple of specific things where I felt like we hadn’t maybe asked things clearly enough or got the full story. Today I wanted to run through a few things that I learned when John and I sat down together. A little side note, I found it really fascinating doing this kind of interview. I sat on stage in a kind of journalistic setting. I had never done this before. 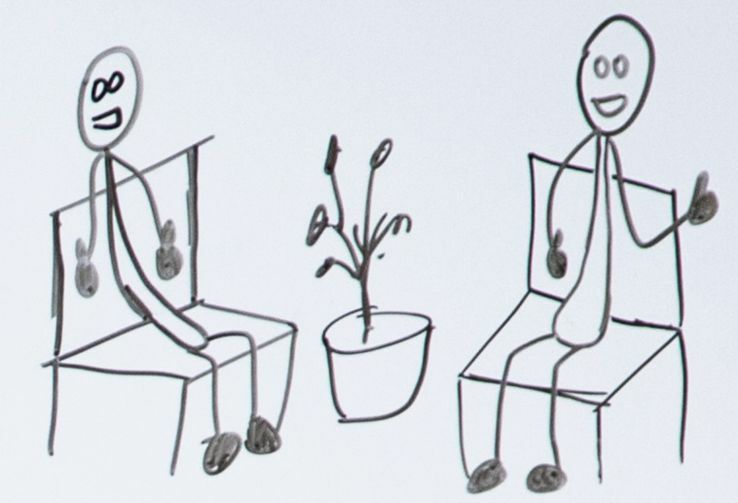 Maybe I’ll do a follow-up Whiteboard Friday one day on things I learned and how to run interviews. 1. Does Google have a “Domain Authority” concept? John said yes. He said yes, they have metrics that, his exact quote was, “map into similar things.”My way of phrasing this was this is stuff that is at the domain level. It’s based on things like link authority, and it is something that is used to understand performance or to rank content across an entire domain. John said yes, they have something similar to that. They use it in particular when they discover new content on an existing domain. New content, in some sense, can inherit some of the authority from the domain, and this is part of the reason why we figured they must have something like this, because we’ve seen identical content perform differently on different sites. We know that there’s something to this. So yes, John confirmed that until they have some of those metrics developed, when they’ve seen a bit of content for long enough, and it can have its own link metrics and usage metrics, in the intervening time up until that point it can inherit some of this stuff from the domain. He did also just confirm that it’s not just link-based. This is not just a domain-level PageRank type thing. This led me into the second thing that I really wanted to get out of him, which was — and when I raised this, I got kind of an eye roll, “Are we really going down this rabbit hole” — the subdomain versus subfolder question. You might have seen me talk about this. You might have seen people like Rand talk about this, where we’ve seen cases and we have case studies of moving blog.example.com to example.com/blog and changing nothing else and getting an uplift. To his credit, John said, “Yes, we’ve seen them as well.” So he said, yes, Google has also seen these things. He acknowledged this is true. He acknowledged that it happens. The way he explained it connects back into this Domain Authority thing in my mind, which is to say that the way they think about it is: Are these pages on this subdomain part of the same website as things on the main domain? My recommendation stays what it’s always been, which is 100% if you’re starting from the outset, put it on a subfolder. There’s no upside to the subdomain. Why would you risk the fact that Google might treat it as a separate site? If it is currently on a subdomain, then it’s a little trickier to make that case. I would personally be arguing for the integration and for making that move. But unfortunately, but somewhat predictably, I couldn’t tie John down to any particular way of telling if this is the case. If your content is currently on a subdomain, there isn’t really any way of telling if Google is treating it differently, which is a shame, but it’s somewhat predictable. But at least we understand each other now, and I think we’ve kind of got to the root of the confusion. These case studies are real. This is a real thing. Certainly in certain circumstances moving from the subdomain to the subfolder can improve performance. In other words, the links off that page, even if you’ve got it as a no index, follow, the links off that page will be effectively no followed. We found that a little bit confusing and surprising. I mean I certainly felt like I had assumed it didn’t work that way simply because they have the no index, follow directive, and the fact that that’s a thing seems to suggest that it ought to work that way. It wasn’t really so much about the specifics of this, but more the like: How did we not know this? How did this come about and so forth? John talked about how, firstly, it has been this way for a long time. I think he was making the point none of you all noticed, so how big a deal can this really be? I put it back to him that this is kind of a subtle thing and very hard to test, very hard to extract out the different confounding factors that might be going on. I’m not surprised that, as an industry, we missed it. But the point being it’s been this way for a long time, and Google’s view and certainly John’s view was that this hadn’t been hidden from us so much as the people who knew this hadn’t realized that they needed to tell anyone. The actual engineers working on the search algorithm, they had a curse of knowledge. That led us into a little bit of a conversation about how John operates when he doesn’t know the answer, and so there were some bits and pieces that were new to me at least about how this works. John said he himself is generally not attending search quality meetings. The way he works is largely off his knowledge and knowledge base type of content, but he has access to engineers. That was my quick run-through of some of the things that I learned when I interviewed John. We’ll link over to more resources and transcripts and so forth. But it’s been a blast. Take care.